I can’t believe it’s September already! 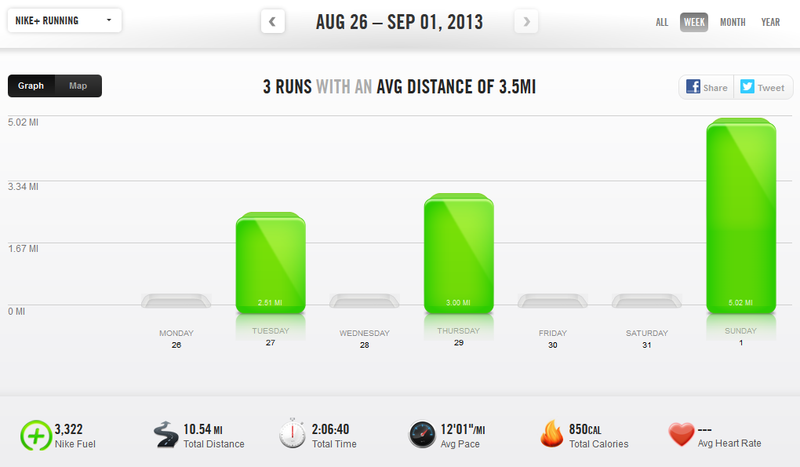 This is the month half marathon training starts! Eeeeek! On Tuesday, I went out to the park to do speed intervals. It had been a rough couple of days, so I really needed to relieve some stress. My plan had me do 13 iterations of 1 minute fast running, 1 minute slow. I did well, although possibly not as well as last week’s intervals, though this week there were more of them and the walk breaks were shorter, so that was to be expected. My fastest interval was the last one at an 8:25 min/mile. Yay! Also, can I just say that running is pretty much the best stress reliever there is? My dad has been having some health issues and I’d been super worried about him and my mom (who is dealing with a lot right now) and this run really helped me calm down. My next run was scheduled for Thursday. I planned to go out after work, but when I checked the weather, I saw the heat index was over 100. Ha! No thanks. So Jonathan and I finished off the second season of “Game of Thrones” instead. I didn’t want a repeat of last week where I let TV watching derail me, so I decided to hit the treadmill. Yes, it was 10:30 at night. But I got my run in! I did three miles without walking. First time since before my injury! I put the treadmill on a 1.5% incline to compensate for lack of wind resistance. There’s some debate over whether this is really necessary, but I find that running on a 0% incline is way easier than running outdoors. Here’s a handy chart to figure out equivalent pacing. I ran the first half mile on 4.5 mph to warm up, the next on 5.0, the next on 5.5, and the next on 6.0. For the last mile, I varied it a bit, slowing down and running on a more intense incline (8%) for a minute or two, and speeding back up to 6.0 and even 7.0 for a minute at a time. It made me feel confident that I could run the 1.88 mile sections of the upcoming relay without walking if I paced myself properly! I had a wedding to shoot on Saturday, so my last run of the week was on Sunday. It was supposed to be 50 minutes, but I decided to just round it out and do a full hour. My main goal was to run 2 miles without walking without being on a treadmill. This didn’t happen. While the weather wasn’t bad and I paced myself okay, the toll of being on my feet for nearly ten hours the day before wrecked havoc on my legs. I made it 1.25 miles before walking. By the end of the hour (and five miles), my legs felt like they might fall off. The day only went downhill from there, so perhaps I should have saved my run for the end of the day instead of the beginning. The marathon relay is this Saturday, so hopefully it will go well! ← When do you become a runner? What half marathon training plan are you doing?